Congee (British English: /ˈkɒndʒi/; or conjee) is a type of rice porridge or gruel popular in many Asian countries. When eaten as plain rice congee, it is most often served with side dishes. When additional ingredients, such as meat, fish, and flavorings, are added while preparing the congee, it is most often served as a meal on its own, especially for the ill. Names for congee are as varied as the style of its preparation. Despite its many variations, it is usually a thick porridge of rice largely disintegrated after prolonged cooking in water. In ancient times, people named the thick congee chan, the watery one chi or mi. The characteristics of congee are that it is easy to digest and very simple to cook. Congee is one of the traditional Chinese foods and has thousands of years of history in China. The Zhou Book says "Emperor Huang Di was first to cook congee with millet as the ingredient", that may be considered the earliest record of congee. The word congee comes from Tamil கஞ்சி (kanji), a prominent food of ancient Tamil people. The English form may have arrived in the language via Portuguese. In other Asian cultures, it is also called hsan pyok (Burmese), kanji (Tamil/Tulu), kaṇhji (Malayalam), pakhal bhat (Odia), ganji (Kannada/Telugu), baw baw (Khmer), juk (Hakka, Cantonese, Korean), muay (Hokkien and Teochew), zhōu (Mandarin), cháo (Vietnamese), deythuk (Tibetan), chok or khao tom (Thai), kayu (Japanese), lúgaw (Tagalog), Bubur or kanji (Indonesian and Malay), jaulo (Nepali) or jaou (Bengali) which is derived directly from the Chinese character 粥 (zhōu, which means gruel), canja (Portuguese). It is also called 稀飯 (pinyin: xifan; Wade–Giles: hsi fan, literally means "watery rice") in some Chinese provinces. In Burma (now called Myanmar), rice congee is called ဆန်ပြုတ် hsan byok [sʰàmbjoʊʔ], literally "boiled rice". It is very thin and plain, often made with just rice and water, but sometimes with chicken or pork stock and served with a simple garnish of chopped spring onions and crispy fried onions. As in other Asian countries, rice congee is considered food for the unwell. Chinese congees (Chinese: 粥; pinyin: zhōu, Jyutping zuk1), or in Cantonese jūk, vary considerably by region. For example, to make Cantonese congee, white rice is boiled in many times its weight of water for a long time until the rice breaks down and becomes a fairly thick, white porridge (Pinyin: báizhōu). Congees made in other regions may use different types of rice with different quantities of water, producing congees of different consistencies. In Taiwan, congee is prepared in the same way as in Fujian Province, China, and consists of rice and water, with few other ingredients. Sweet potato is often added for taste, and eggs are sometimes beaten into it to thicken it to a gruel. As with most Chinese styles, congee is often served to the ill and those with difficulty chewing. A variety of side dishes are often served with congee, as well. In Tamil Nadu, a plain rice porridge, or the thick supernatant water from overcooked rice, is known as kanji. Kanji or Congee is also prepared with different grains available in different parts of Tamil Nadu, for example minor millet or pearl millet, finger millet, broken wheat, maize.The people of Kerala also call this preparation of rice in a watery state kanji, and it is eaten as a porridge with green lentils or chutney. Kanji is prepared with rice or ragi. Nuts and spices are added to the kanji depending on the economic status or health requirements. Rice kanji is prepared by boiling rice in large amounts of water. To this preparation, either milk and sugar (usually jaggery) or curd (yoghurt) and salt are added. Ragi kanji is prepared by drying ragi sprouts in shade, and then grinding them into a smooth powder. This powder is added to water and cooked. Milk and brown sugar are added to this cooked preparation for taste. Ragi kanji can be given to infants after six months. Another kanji preparation uses jevvarisi (sago in English, sabudana in Hindi) in kanji. Sago is dry roasted and powdered with/ without sugar. Powdered sago is boiled in water until cooked. This is eaten by all ages from adults to infants as young as three months. In the state of Kerala, Kanji is considered as a main course particularly for dinner by majority. This is normally taken with roasted coconut chutney, tossed Moong dal popularly known as Payar and roasted Pappadam (Lentil crackers). The royal households as well as rich people used to have a special kind of Kanji called as Palkanji (Milk Congee) where milk was substituted for water base. During the Malayalam month of Karkkidakam, a medicinal kanji is made using Ayurvedic herbs, milk and jaggery. Karkkidakam is known as the month of diseases since the monsoon starts during Karkkidakam. Karikkidaka Kanji is eaten to promote the immune system. According to the Indian writer Madhur Jaffrey, kanji is, or is derived from, a Tamil word for "boilings", referring to the porridge and also to any water in which rice has been cooked. Muslims of south India especially Tamil Muslim, Mappila and Beary prepare special congee during month of Ramadhan which is called "nombu kanji" literally meaning "fasting porridge." This is prepared by adding spices like turmeric, dry ginger, pepper, onion, and coconut paste to the congee. Sometimes fenugreek seeds are added to it to enhance the flavor. Kaanji is a traditional Odia dish. It is a soup-based dish like dal, but tastes a little sour. It is made of rice starch fermented for a few days in an earthen pot. This is considered a very healthy dish as lots of winter vegetables are used as main ingredients. It is seasoned with mustard seeds and turmeric and served hot. In Indonesian, congee is called bubur, and it is a favourite breakfast food in the country. Every morning, travelling cart of bubur ayam vendors are often found regularly frequenting residential area to sell their wares in the neighbourhood. A popular version is bubur ayam, which is rice congee with shredded chicken meat. It is also served with many condiments, such as green onion, crispy fried shallot, fried soybean, Chinese crullers (youtiao, known as cakwe in Indonesia), both salty and sweet soy sauce, and sometimes it is topped with yellow chicken broth and kerupuk (Indonesian style crackers). Unlike many other Indonesian dishes, it is not spicy; sambal or chili paste is served separately. In another region of Indonesia — the city of Manado in North Sulawesi, there is a very popular type of congee called tinutuan, or also known as bubur Manado (Manadonese porridge). It is rice porridge served with ample amount of vegetables. A bit different from the one sold in Java, it is made from rice porridge, enriched with vegetables which includes kangkung (water spinach), corn kernels, yam or sweet potato, dried salted fish, kemangi (lemon basil) leaves and melinjo (Gnetum gnemon) leaves. Kayu (粥), or often Okayu (お粥) is the name for the type of congee eaten in Japan, which is less broken down than congee produced in other cultures. For example, a Cantonese jūk typically uses a water-to-rice ratio of 12:1, but kayu typically uses ratios of 5:1 or 7:1. Also, its cooking time is shorter than other types of congee: kayu is cooked for about 30 minutes, while Cantonese jūk cook for an hour or more. Kayu may be made with just rice and water, and is often seasoned with salt. Eggs could be beaten into it to thicken it into gruel. Toppings may be added to enhance flavour; Welsh onion, salmon, roe, ginger, and umeboshi (pickled ume fruit) are among the most common. Miso or chicken stock may be used to flavor the broth. Most Japanese electric rice cookers have a specific setting for cooking congee. 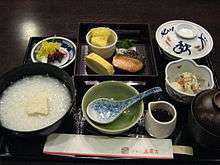 In Japan, congee is popularly known as a food served to the ill. Because it is soft and easily digestible, okayu is commonly the first solid food served to Japanese infants; it is used to help with the transition from liquids to normally cooked "plain" rice, as it is a major part of the Japanese diet. It is also commonly eaten by the elderly for the same reasons. A type of kayu called nanakusa-gayu (七草粥, "seven herb porridge") is traditionally eaten on 7 January with special herbs that some believe protect against evils and invite good luck and longevity in the new year. As a simple, light dish, nanakusa-gayu serves as a break from the many heavy dishes eaten over the Japanese New Year. In Korea, the dish goes by the name juk 죽 (IPA: [tɕuk]). More than 40 varieties of juk are mentioned in old documents. Depending on the ingredients and consistency, juk can be considered as a food for recuperation, a delicacy, or famine food. 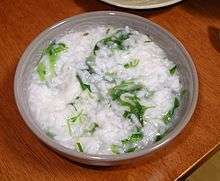 The most general form of juk is simply called huin juk (흰죽, white juk), which is made from plain white rice. Other varieties include different ingredients, such as vegetables, seafood, nuts and other grains. Being largely unflavored, it is served with a number of more flavorful side dishes, such as jeotgal, various types of kimchi, pickled cuttlefish, spicy octopus, and others. Notable varieties include jatjuk made from finely ground pine nuts, jeonbokjuk made with abalones, yulmujuk made from Job's tears, and patjuk made from red beans. Juk is considered the ideal choice of food for babies, the ill or elderly, as it is easily eaten and digested. It is sold commercially by many chain stores in South Korea, and is a common takeout dish. Lugaw (pronounced [ˈluɡaw]) is the Tagalog name for congee. Otherwise similar to Cantonese-style congee, lúgaw is typically thicker, retaining the shape of the rice, but with a similar texture. It is boiled with strips of fresh ginger. Other flavors may be added according to taste. Most often it is topped with scallions and served with crispy fried garlic. As with Japanese okayu, fish or chicken stock may be used to flavor the broth. Lúgaw can also be served with tokwa't baboy (diced tofu and pork), goto (beef tripe), utak (brain [of pig]), dilà (tongue [of pig]), litid ([beef] ligaments), and with calamansi, patís, and soy sauce. It is often served to the ill and the elderly, and is favoured among Filipinos living in colder climates because it is warm, soft, and easy to digest. Some provinces prefer the Spanish-influenced arroz caldo (an anglicisation of caldo de arroz, literally "rice soup"), which is often thought to be a European dish because of its name. Arroz caldo is actually a Chinese congee that was adapted to the tastes of the Spanish colonial settlers who patronised Chinese restaurants in the Philippines. Arroz caldo is usually spiced with saffron and black pepper in place of or in addition to the more traditional ginger and scallion. Arroz caldo is more popular among Ilocano, Hiligaynon, and Cebuano peoples (who locally called it as pospas), although those of other provinces, such as Cebu and Bohol, often eat it with the addition of prawns, olive oil, bay leaf, and Chinese sausage. A dessert version of lugaw is champorado, which is made with rice, cocoa powder and sugar, and topped with milk. It is usually served in the afternoon as a snack, although it can also be eaten for breakfast. In other Hiligaynon-speaking places, lugaw may refer to binignit, a different dessert soup. Plain rice congee, known as khao tom kui (Thai: ข้าวต้มกุ๊ย), is often eaten at specialized restaurants which serve a multitude of side dishes to go with it, such as yam kun chiang (a Thai salad made with sliced dried Chinese sausages), mu phalo (pork stewed in soy sauce and five-spice powder), and mu nam liap (minced pork fried with chopped Chinese olives). In Turkish cuisine, wheat-based mixed dessert congee is called as Ashure. It is a little similar with eight ingredient Chinese congee. It mostly uses seven, ten or twelve ingredients. The ingredients can vary spontaneously but it must be vegan (no animal-based ingredients) like nuts, fruits, grains and sugar. Twelve ingredients represent Alevi behavings called as Twelver. Alevi communities cook it at the tenth day of Muharrem which is the first month of the İslamic calendar. It is a common dessert in Turkey, Greece and Albania. In Vietnam, rice congee, called cháo (Vietnamese: cháo), is sometimes cooked with pandan leaves or Asian mung bean. In its simplest form (plain rice porridge, known as cháo hoa), it is a food for times of famine and hardship to stretch the rice ration. Alternately, as is especially common among Buddhist monks, nuns and lay people, it can be a simple breakfast food eaten with pickled vegetables or fermented tofu (chao). Despite its humble ubiquity among the poor, it is also popular as a main entrée when cooked with a variety of meats. For example, cháo gà is cooked with chicken, garlic, and ginger. The rice porridge is cooked in the broth in which a whole chicken had been boiled, and once the chicken is cooked, the meat is sliced and layered on a bed of shredded raw cabbage and sliced scallions and drizzled with a vinegar-based sauce, to be eaten as a side dish to the porridge. Other combinations include cháo vịt (duck porridge), which is cooked in the same fashion as the chicken porridge, but with duck. Cháo lòng heo is made with lòng heo, a variety of offal from pork or duck with sliced portions of congealed pork blood. Cháo is typically served with quẩy on the side. Cháo bầu is a congee containing pig kidney (bầu dục lợn). A specialty of the Hóc Môn district in Ho Chi Minh City, it is typically eaten in rural areas of southern Vietnam. Well-known cháo bầu vendors include Cánh Đồng Hoang, Cô Ba Nữ, and Sáu Quẻn. It is also common to eat cháo during an illness, as it is believed the porridge is easy to digest while being fortifying. For such purposes, the cháo is sometimes cooked with roasted white rice, giving the porridge broth a more nuanced body and a subtle, nutty flavor. In some parts of Vietnam, local customs call for making cháo as offerings for the "wandering souls" during the Buddhist Vu Lan summer feast. 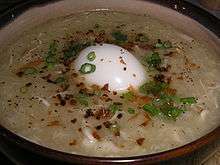 Wikimedia Commons has media related to Congee. 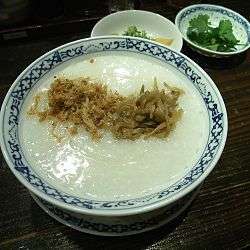 ↑ "Rice congee – SpeedyLook encyclopedia". Myetymology.com. Retrieved 2012-11-24. ↑ "Basic Congee Recipe". about.com. Retrieved May 2, 2007. ↑ "NATIONAL / TAMIL NADU : Minister moots heritage tourism plan for Jawadu Hills". The Hindu. 2012-08-19. Retrieved 2012-11-24. ↑ Shonali Muthalaly (2010-06-11). "Life & Style / Food : The Reluctant Gourmet – Back to the basics". The Hindu. Retrieved 2012-11-24. ↑ Syed Muthahar Saqaf (2012-04-08). "NATIONAL / TAMIL NADU : Desi version of porridge sold like hot cakes". The Hindu. Retrieved 2012-11-24. ↑ "Karkkidaka Kanji". Srikumar.com. Retrieved 2012-11-24. ↑ indonesiasecretkitchen. "Indonesia Secret Kitchen: Bubur Mengguh recipe". Indonesiasecretkitchen.blogspot.nl. Retrieved 2012-11-24. ↑ "Okayu recipe". about.com. Retrieved May 2, 2007. ↑ The Ultimate Rice Cooker Cookbook: 250 No-Fail Recipes for Pilafs, Risotto … - Beth Hensperger – Google Books. Books.google.co.jp. 2010-03-31. Retrieved 2012-11-24. ↑ ジャパン: 四季と文化 - Clive W. Nicol – Google Books. Books.google.co.jp. Retrieved 2012-11-24. 1 2 "Juk" (in Korean). Doosan Encyclopedia. ↑ "Food industry eyes baby market" (in Korean). Newsis Health. March 30, 2010. ↑ "Busy juk restaurants" (in Korean). City News. May 17, 2010. ↑ "Enjoy Teochew porridge with popular dishes" (PDF).